Picture ANY of your favorite contemporary Jazz guitar players RIGHT NOW. So do you have someone in mind? Whoever you are picturing right now, fantasizing or idolizing about, let us tell you that all younger Jazz guitarists may play and compose very unique, new, creative and contemporary music and THEY ALL have many influences from different places and styles flowing into their music in this day and age. Being able to speak and communicate in the language of the previous generations will ALWAYS be a part of today’s players. You would be surprised at how many of the young and upcoming generation of guitar players have a very strong fundamental knowledge and understanding of the Jazz Blues. If you play any style of contemporary music from this century, the blues is genetically tied to it in one way or another. Which genre of music do you think is one of the oldest and most influential when it comes to playing an electric guitar? The one genre that started the evolution of countless great players. You are right, it’s the Blues. And in its more advanced form called a Jazz Blues. Now let us be honest with you. We will be completely straight with you. Nevertheless being able to play a Jazz Blues is definitely one HUGE piece of the puzzle and part of the game. All of your favorite artists from the past decades to the present day have played a Jazz Blues. You don’t have to analyze and transcribe your favorite players to realize how common playing a Jazz Blues is. But one thing’s for sure, if you really dig deep enough you will ALWAYS find fragments, pieces of a solid foundation of Jazz Blues playing, in EVERY great Improviser’s solos. THEY ALL learned at some point the words, phrases, and vocabulary of a Jazz Blues. But be warned, you could wander around FOR YEARS and waste your valuable time and energy picking up information here and there, trying to understand the “whole picture” of what is necessary for jazz improvisation. TAGA Publishing proudly presents to you Jazzify Your Blues by Armen Movsesyan. “Jazzify Your Blues” will indeed get you there, and get you there fast! Song examples for Bag’s Groove, Fried Pies, Missile Blues, etc. All of the performances are tabbed out and notated for your practice, reference and study purposes. You’ll also get supported by the newest Soundslice Technology. Our Jazzify Your Blues by Armen Movsesyan course documents your experience with high-quality videos, tab, standard notation and tons of pages of bonus PDFs of supplementary material from Armen. 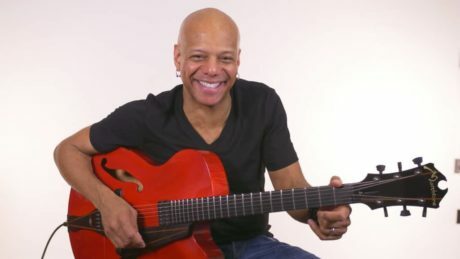 If YOU are serious about getting your Jazz guitar skills to the next level, then there is NO WAY around learning the sound and language of a JAZZ BLUES. BE the one who knows the necessary phrases for this language. BE the one who is able to speak this language fluently. Plus, you’ll have a ton of fun following Armen’s format for the course. No tedious theory to assimilate. No exercises to master. As with most of Armen’s guitar lessons, you will play your way through the course and start blowing jazzy blues lines right from the very first lesson. We at TAGA Publishing are proud to have you experience Jazzify Your Blues by Armen Movsesyan in its full and rich entirety. Armen is a good player. I didn’t know about him until now, he definitely helped jazz up my Blues so far! Thanks for that! Cool lines! Armen demonstrates very important phrases of Wes Montgomery and Kenny Burrell. It’s a good mix of traditional and modern phrases. The Soundslice technology is really good to practice and should keep you busy practicing for a while. Really liked this! This course was not for me. I am a more traditional player. Armen is such a great player and I am so happy to learn from him. I wish one day I can play half as good as him. Good but kind of advanced for me.